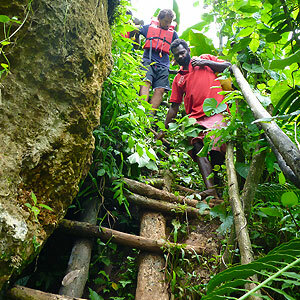 Was it the trek through lush tropical forest, the darkness of the cave, canyoning under and over boulders, the river swim or the steep climb to return to the Village? Join us and discover for yourself. 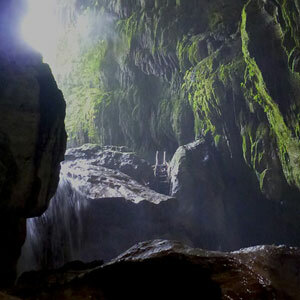 Millennium Cave is situated in South Central Santo, a 45 minute drive from Luganville town. When your transport stops, a 15 minute walk then takes you through coconut plantation and across a bamboo bridge leading to the village of Funaspef. This Village is likely to be the home of your Tour Guide and within the traditional Nakamal building he will explain the tour, showing a map and the route to be followed. You are provided with a torch, life jacket and floatation aid for the walk through the cave and the river swim. The trip is interesting and amazing, starting with a walk through narrow jungle paths, across creeks and cascades. 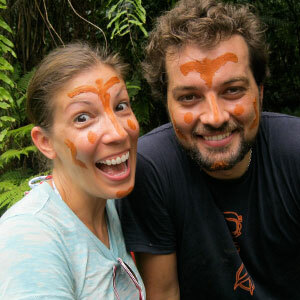 Before the approach to the Cave, symbolic etching from clay paste is applied to your face, ensuring a safe passage through the river and Cave. At this point another guide can take your pack, which provides protection from anything that might get wet as well as the ability to walk unobstructed through the Cave. At the mouth of the Cave the torches are handed out by your Tour Guide. Once inside the Cave, follow your Guide as you navigate the river bed, examine the walls of the Cave and aim your torch up to the Cave roof, where high up is the home of tiny bats and swallows. Once through the Cave, you are reunited with your bag or pack and it is time for a break and opportunity to snack or lunch. Now the river adventure begins ….. the boulders are huge; you climb under and clamber over, testing your fitness and sense of adventure. 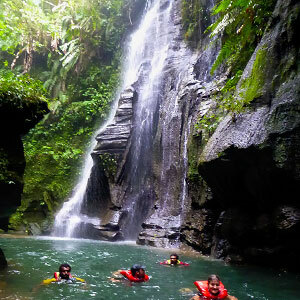 Along the river swim soak up the breath taking scenery with cascading falls and towering rock faces, take the time to shower under the water fall or jump into the river from surrounding rocks. But it is still not over after the river swim … there is a steep climb up to the ridge and the pathway which returns to Funaspef Village, where tropical fruit and sweet coffee awaits you. Dry clothes to change into at the end of the tour.